"We really don't understand what makes the human brain special," said Ed Lein, Ph.D., Investigator at the Allen Institute for Brain Science. "Studying the differences at the level of cells and circuits is a good place to start, and now we have new tools to do just that." In a new study published today in the journal Nature Neuroscience, Lein and his colleagues reveal one possible answer to that difficult question. The research team, co-led by Lein and Gabor Tamas, Ph.D., a neuroscientist at the University of Szeged in Szeged, Hungary, has uncovered a new type of human brain cell that has never been seen in mice and other well-studied laboratory animals. Tamás and University of Szeged doctoral student Eszter Boldog dubbed these new cells "rosehip neurons" -- to them, the dense bundle each brain cell's axon forms around the cell's center looks just like a rose after it has shed its petals, he said. The newly discovered cells belong to a class of neurons known as inhibitory neurons, which put the brakes on the activity of other neurons in the brain. The study hasn't proven that this special brain cell is unique to humans. 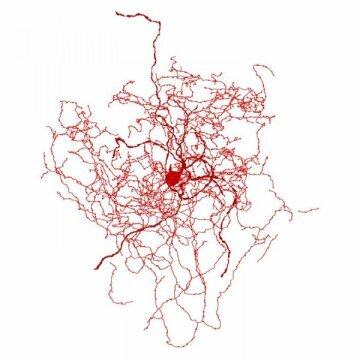 But the fact that the special neuron doesn't exist in rodents is intriguing, adding these cells to a very short list of specialized neurons that may exist only in humans or only in primate brains. The researchers don't yet understand what these cells might be doing in the human brain, but their absence in the mouse points to how difficult it is to model human brain diseases in laboratory animals, Tamás said. One of his laboratory team's immediate next steps is to look for rosehip neurons in postmortem brain samples from people with neuropsychiatric disorders to see if these specialized cells might be altered in human disease. In their study, the researchers used tissue samples from postmortem brains of two men in their 50s who had died and donated their bodies to research. They took sections of the top layer of the cortex, the outermost region of the brain that is responsible for human consciousness and many other functions that we think of as unique to our species. It's much larger, compared to our body size, than in other animals. "It's the most complex part of the brain, and generally accepted to be the most complex structure in nature," Lein said. Tamás' research lab in Hungary studies the human brain using a classical approach to neuroscience, conducting detailed examinations of cells' shapes and electrical properties. At the Allen Institute, Lein leads a team working to uncover the suite of genes that make human brain cells unique from each other and from the brain cells of mice. Several years ago, Tamás visited the Allen Institute to present his latest research on specialized human brain cell types, and the two research groups quickly saw that they'd hit on the same cell using very different techniques. "We realized that we were converging on the same cell type from absolutely different points of view," Tamás said. So they decided to collaborate. The Allen Institute group, in collaboration with researchers from the J. Craig Venter Institute, found that the rosehip cells turn on a unique set of genes, a genetic signature not seen in any of the mouse brain cell types they've studied. The University of Szeged researchers found that the rosehip neurons form synapses with another type of neuron in a different part of the human cortex, known as pyramidal neurons. This is one of the first studies of the human cortex to combine these different techniques to study cell types, said Rebecca Hodge, Ph.D., Senior Scientist at the Allen Institute for Brain Science and an author on the study. "Alone, these techniques are all powerful, but they give you an incomplete picture of what the cell might be doing," Hodge said. "Together, they tell you complementary things about a cell that can potentially tell you how it functions in the brain."